Enhanced rooms may include rooms with desirable views, rooms on high floors, corner rooms, rooms with special amenities, rooms on Executive Floors, or suites. In other words though Marriott had been trumpeting that the Starwood upgrade benefit would prevail — that a Platinum member would be upgraded to a standard suite if available — the program terms said that a hotel was compliant as long as the member was upgraded even to a higher floor or corner room and not an available standard suite. The new Marriott program’s terms have been updated and they’ve fixed this. Platinum Elite Members receive a complimentary upgrade to the best available room subject to availability for the entire length of stay at the time of check-in. Complimentary upgrade includes suites, rooms with desirable views, rooms on high floors, corner rooms, rooms with special amenities or rooms on Executive Floors. Only 75 night elites (Platinum Premier) should be upgraded to suites at Ritz-Carlton properties. Lesser upgrades should be available to Platinums. That’s not what Marriott trumpted when they announced the new program in April and the upgrade benefit. Each hotel gets to decide what rooms are in the upgrade pool. So if a hotel designates a room as upgrade inventory, it has to offer the room to Platinums. But there will certainly be hotels playing inventory games defining rooms out of the upgrade pool. Upgrades are not available at Marriott Vacation Club, Marriott Grand Residence Club, Aloft, Element or Vistana properties. In practice we’ll watch to see how each hotel handles upgrades. There were always Starwood hotels that were more generous than others, and properties that ignored the upgrade benefit. The SPG program though was generally good at responding to complaints, at least after the fact, where it was verifiable that a hotel wasn’t meeting its obligations under the terms of the program. At least the Marriott terms no longer suggest ‘anything goes’ and as I’ve reported previously Marriott is now compensating hotels based on elite guest satisfaction, which is new this year. So there’s an incentive to keep Platinums happy. What was the outcome of the whole “one time” policy on Meetings earning 10 nights? I believe all Platinum Premiers are entitled to suite upgrades at Ritz Carlton’s. So both 75 night platinum premuer elites and lifetime platinum premier elites. @Ryan – you are starting to sound like DCS (who fortunately doesn’t post here anymore). Haven’t heard the argument yet that “SPG was the worst with upgrades”. I mean let’s get real. – Having to choose breakfast as your amenity has now made it over to Marriott. That stinks. – 3 points per dollar stunk. I remember spending $1300 for a 6 night stay at the San Jose Sheraton (which was a dump and a half ) and I got 3900 points. That’s equivalent to 12000 Marriott points. In Marriotts program that would equate to 1300×15 and I would have had over 20,000 points. Also SPG has a tiny almost useless footprint and many Sheratons I stayed at were just pitiful with lobby’s that smelled like they were pumping some cheap perfume through the air conditioners. Marriott has some rough properties too but with so many and extensive renovations done recently I found it way easier to find nice properties. 3 stays at the over rated and dilapidated Sheraton Grande Sukhumvit and ZERO upgrades. Yeah had to stay here due to location and the other people I was with. 5 different stays at my new favorite. Marriott Marquis Queens Park and FIVE times pre- upgrades to an M suite. Also 3 stays at the Renaissance Ratchaprasong and THREE times in a Junior suite. I could care less of the Sheraton in Podunk USA is better at putting you in a suite that’s probably not that nice. I love how Marriott hotels international have put me in suites without ever asking and those are suites worth enjoying. To each his own. Yeah I think SPG = sucked. Wow, I am 9 out of 9 at suite upgrades with the SGS. Usually staying on rock bottom rates or points. Sometimes SNAs, sometimes not. One of the easier upgrades in the system IMO. If you have a pulse, you should be getting a suite in Asia. Every chain. Not a differentiating factor. Of course, #FactCheck, thanks to the SPG merger (with its better benefit plan) one can now get breakfasts in Marriott resorts that didn’t have them before, get the $10 credit for two in CYs that didn’t exist before, get SNAs, get 4pm guaranteed check-out, get an Ambassador, get Your24, get your welcome amenity points now doubled, and of course have access to a ton more luxury properties that are slim pickings at Marriott…Thanks Starwood! @gary – Are you sure you can still qualify for Marriott platinum off of 25 Starwood stays? I thought so and have hit 25 SPG stays (43 nights total) and have not seen my status change for 2 weeks. Called Marriott and the CSR said that there is no more qualifying on stays. Your experience is valid, but anecdotal. Statistically, SPG Platinums were the happiest and the most upgraded. For every one person who doesn’t seem to get the fuss about SPG, there are 10 SPG members who won’t let go of the old program. The words, terminology and intent *definitely* matter because people HAVE complained to SPG and gotten compensation. Similarly, hotels could be gently reminded/coaxed into upgrades by a simple question since they were well aware that they are obliged to offer them. With Marriott/Hilton, you could hit a brick wall, once they repeat that they have already upgraded you to the parking lot view (from no view), there’s not much recourse, they din’t do anything wrong. SPG compensated people! The biggest thing keeping Plats out of suites at SPG was not asking. Often, if you did not proactively ask, you wouldn’t receive. Also if your stays are longer, its very likely you wouldn’t be upgraded. SGS is a super popular platinum heavy hotel and as UA-NYC noted, he has had exceptional luck here. At 420 rooms with 46 suites, it has an average to ordinary suite:room ratio with a fair amount of standard suites (not all 46 are standard). Marquis Queens Park is over twice the size (1287 rooms) with over twice the suites (101) with a greater proportion of them being standard suites. The overall ratio is lower but so is the occupancy, which means the higher absolute number of suites makes a huge difference. Also this property in general is great with upgrades. Renaissance is 268, half the size of Sheraton with high occupancies as well but DOUBLE the suite:room ratio since it has 56 suites. You are absolutely correct in your inference that properties have discretion over specific upgrade policies. However while SPG hotels had perhaps too much discretion, this discretion is basically infinite at Marriott/Hilton. Also while Marriott’s footprint is great in Bangkok, SPG’s non-USA/UK footprint in major global cities is almost always better than Hilton or Marriott’s. However, Marriott worked for you, SPG did not, you were absolutely right to penalise them for it and take your business to Marriott. The courtyard and resort benefit is a nice extra perk. Im pretty happy about that. I stay at Courtyard often. Since i travel for work I just negotiated a breakfast rate but now life will be much easier. @Gary–IMPORTANT. Saw a surprising comment by someone on OMAAT last night and I don’t think anyone has picked up on it yet. Yesterday, Marriott must have run an update and REDUCED some people’s lifetime nights without notice or warning. Speculation is that is has sometime to do with the calculation of 2018 nights by people who have the SPG AMEX. The commentator’s lifetime nights went down by five, as did mine. THE REAL PROBLEM with this is that Marriott posted that it was done with calculating lifetime nights except for people who had issues, and my lifetime nights have been stable since I merged my accounts shortly after the conversion. Any followup would be appreciated, and your readers may want to check their lifetime nights since what was true yesterday may not be true today. status.marriott.com has not been updated since August 30. Really disappointed in Marriott. Marriott led with their chin on this one, via the premature assurances at the time of the launch. It’s not a good look that now they have to issue clarifications, explanations, climb-downs, back-tracks, even though the result may be good for consumers ( at least PLTs). The way they’ve managed the merger has not resulted in much goodwill. In respect of Bangkok as an example of how SPG worked, I’ve never had any luck at SGS. Gave them 3 or 4 tries and simply stopped staying there. Why would I pay a premium for something to no good effect, when the Westin across the road offers a more than acceptable alternative, almost invariably a suite, at about 70% of the price? But I understand that for many the SGS experience is better than mine. Certainly I don’t have a problem with hotels prioritising returning guests for upgrades, a no-brainer. The StR: I’m not a fan of the brand, don’t like to decor and don’t want a butler. However, the 3 times I’ve stayed at StR Bangkok, I did get the Astor suite, suggesting to me that they tried pretty hard to play by the rules ( and this was entirely unsolicited). Just had several stays with Marriott. No suites at ANY property. Was given lounge access to every property with a lounge. All paid stays. @DSK – the LT total was overstated for ones’ total number of SPG nights this year (there was double counting in effect). I know this because I had 42 nights w/SPG pre-8/18, then on 8/18 my SPG LT nights went up by that amount once Marriott took over. And then when combined, it was still overstated by 42 nights. Those 42 nights just disappeared last night, so I am now fully accurate. SPG AmEx nights are another issue though – those never counted for LT, but Marriott probably had them coded incorrectly during the combination. @Beachfan, Lifetime Platinum Premiers are Platinum Premier in name only. LPPs do not get the same benefits as entry level annual PPs. They even get benefits that are less than an annual Platinum. 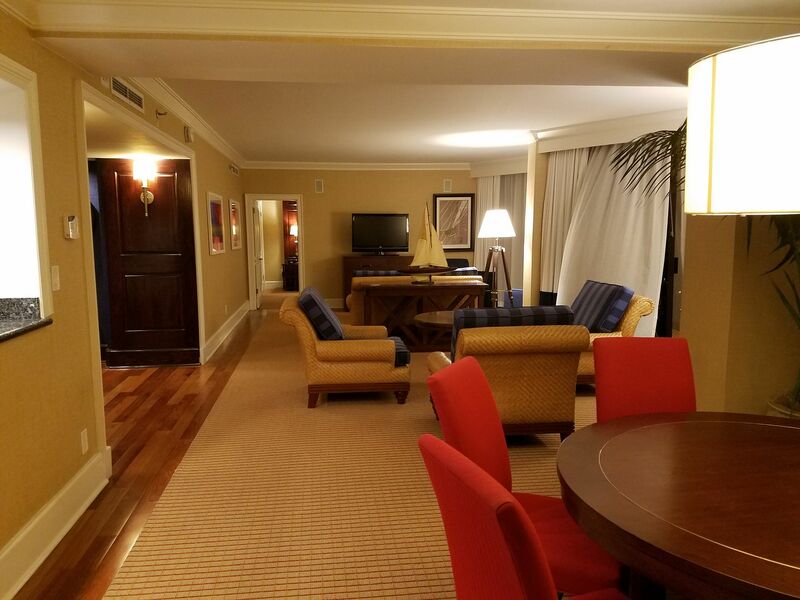 Suite upgrades at Ritz Carlton may be another poke in the eye with a sharp stick for the small and shrinking group of Marriott’s most loyal customers who have earned LPP status. A crock. @John – now you are just flat out posting false information. Other than the earned SNAs (legacy from the SPG program), there is zero difference between LTPP and PP. @UA-NYC, I am exactly correct. The benefits are not the same. No SNAs and no gift option for LPP. Every PP gets those and even Platinum. @John – you probably come from the Marriott side of the house. For those of us from Starwood for the 7 years of SNAs, even if you were LT Platinum, you only got the SNAs by spending 50 nights a year, every year. This is nothing new. This is still a lot better than what Marriott had before. Besides that, there is no difference between LTPP and PP. LTPP is, yes, a lifetime version of Premier Platinum status. And I will be happy to no longer have to do 75 or even 100 nights a year since I now have it. Gary; given the confusion on whether Lifetime PP is eligible for upgrades at Ritz Carltons, can you reach out to Marriott? Your post was different from what I was lead to believe.